Hokkien mee, char kway teow, and fishball noodles are some of my usual go-to orders in a kopitiam. But whenever I feel like changing things up a little, the Western stall is where I’ll head to. So imagine my delight when I discovered a new Western hawker stall in Ang Mo Kio! 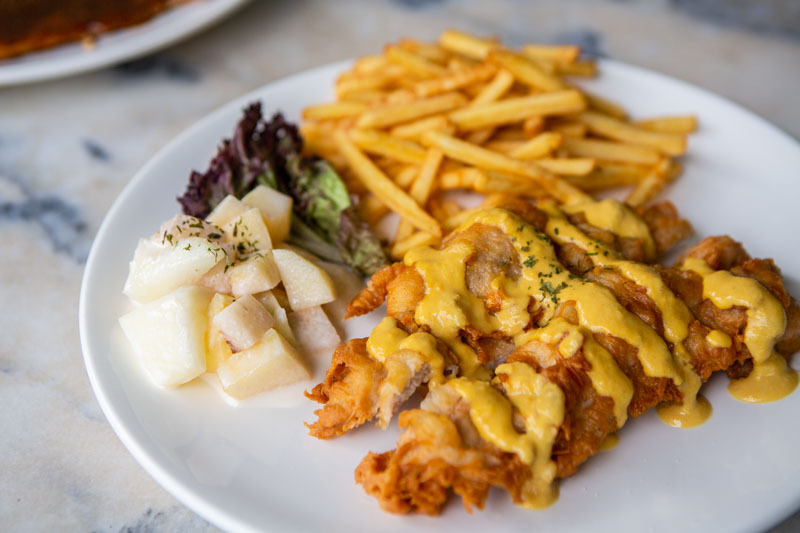 Located in the coffeeshop of Block 158, De Ar Western 阿德 serves up a variety of classic Singaporean-style Western dishes, but with a modern twist. Not only that, they keep their prices relatively affordable too. 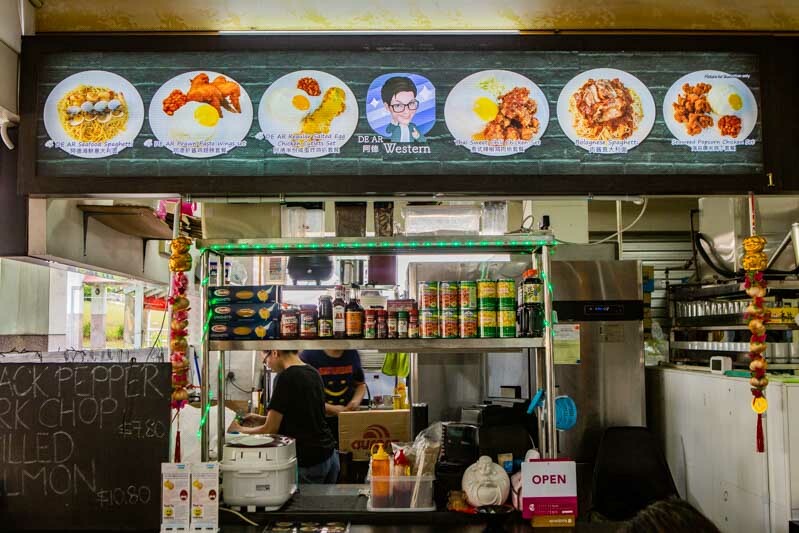 The owner, 阿德 Ah De, named the stall after himself. Interestingly, however, Ah De didn’t start out in the food industry. His passion for food got him to learn how to cook on his own. I was intrigued, as some of the dishes on his menu were quite uncommon. One such dish is the DE AR Signature Pomfret & Chips 阿德炸黑鲳鱼柳 (S$12.80). First of all, pomfrets are relatively pricey fishes. So to find one at such an affordable price was quite a steal, and it’s also rare to find them done in a Fish & Chips style in a hawker setting. 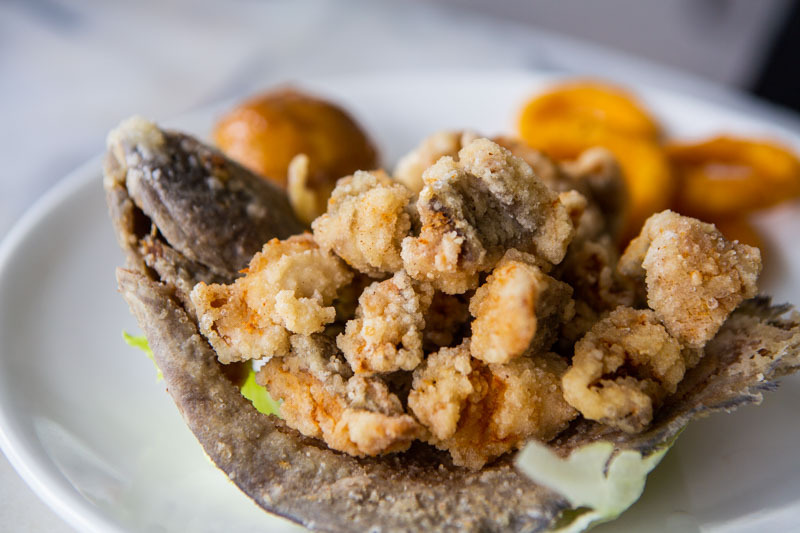 De Ar slices the pomfret’s flesh into cubes before deep-frying them all together. We found this a very thoughtful idea as it saved us the trouble of having to pick out the bones. Crispy on the outside and moist and flaky on the inside, the pomfret cubes reminded me a little of fish fingers. 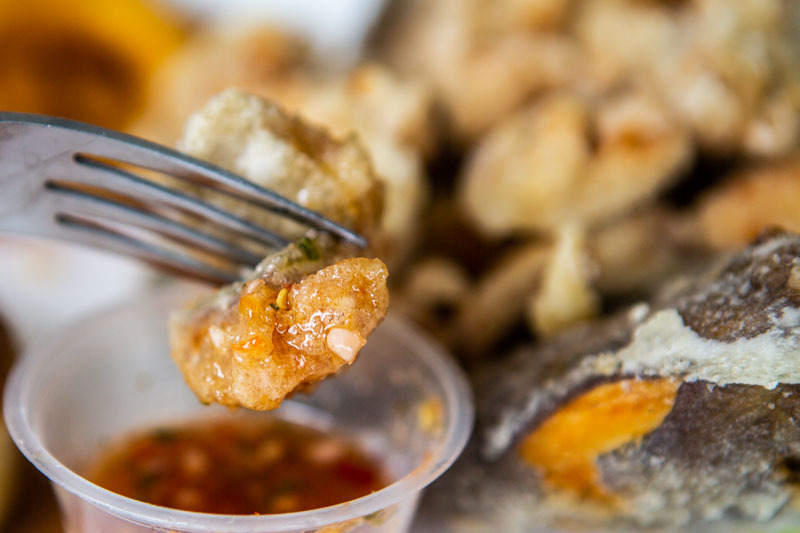 In addition, De Ar Western serves it with a homemade Thai-style sweet chilli sauce. 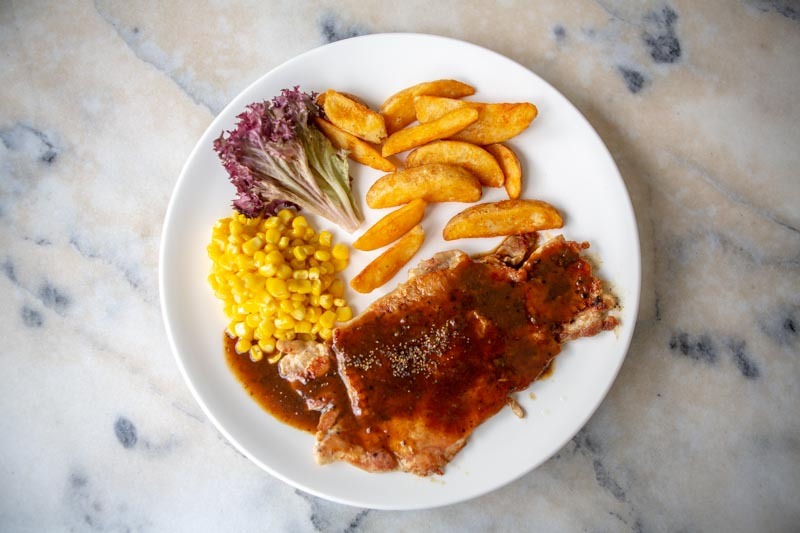 This sauce definitely elevated the pomfret to another level with its zesty and spicy flavours. It went so well with the fish that we didn’t spare a single drop of it! 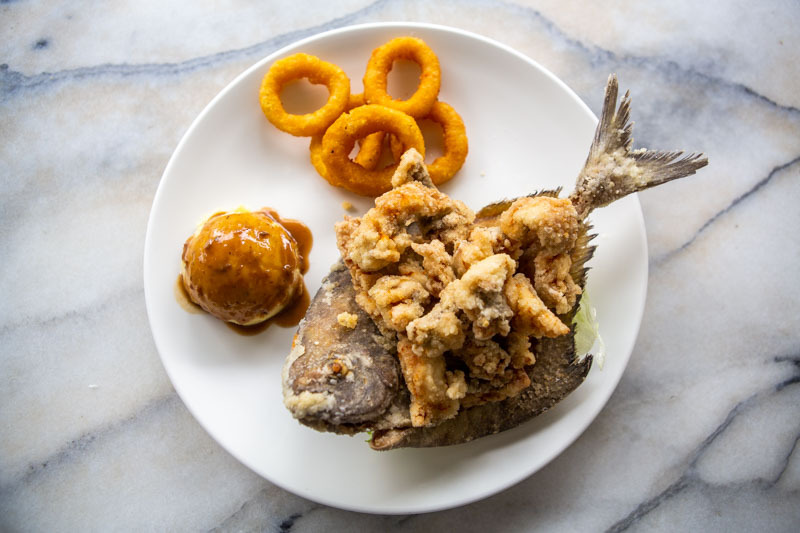 Apparently, the idea for this one-of-a-kind dish came from Chef Alvin Leong of Baba Chews. 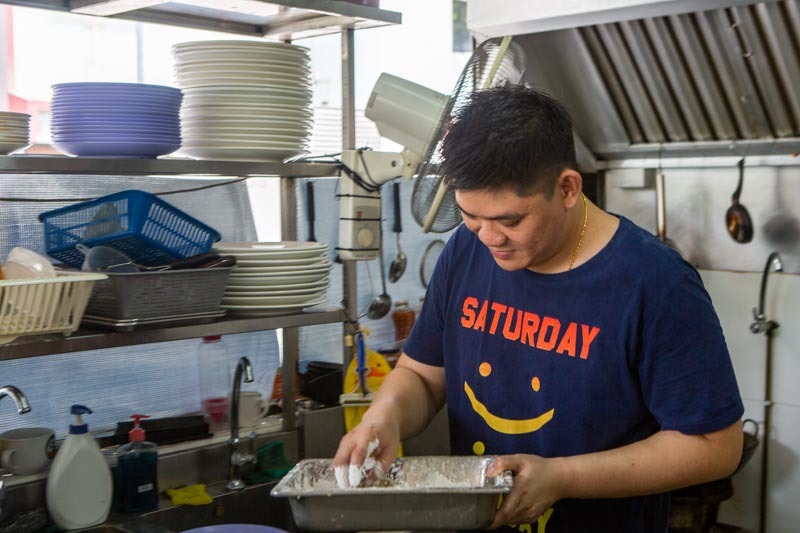 Chef Alvin was a customer of Ah De back when his stall was still in Katong. Ah De took the idea and experimented with it several times before finally coming up with this masterpiece. 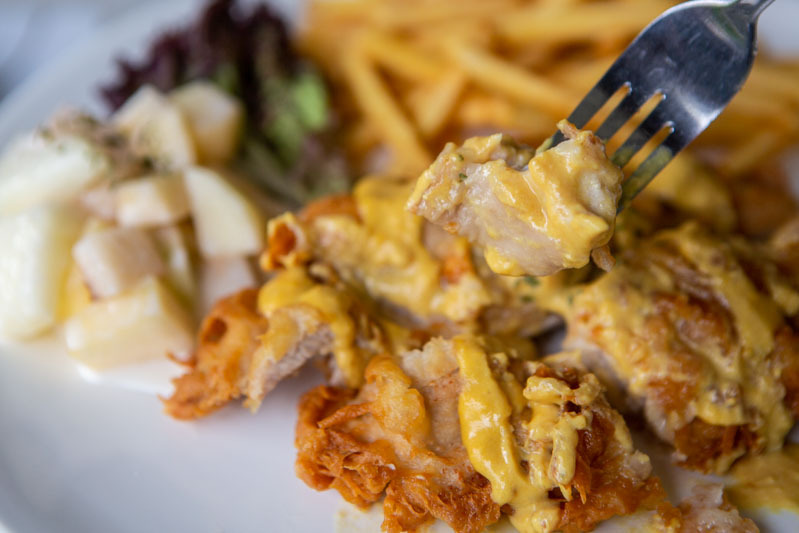 Moving on, we had the DE AR Salted Egg Chicken Cutlets 阿德咸蛋炸鸡排 (S$7.80), another of De Ar’s popular dishes. 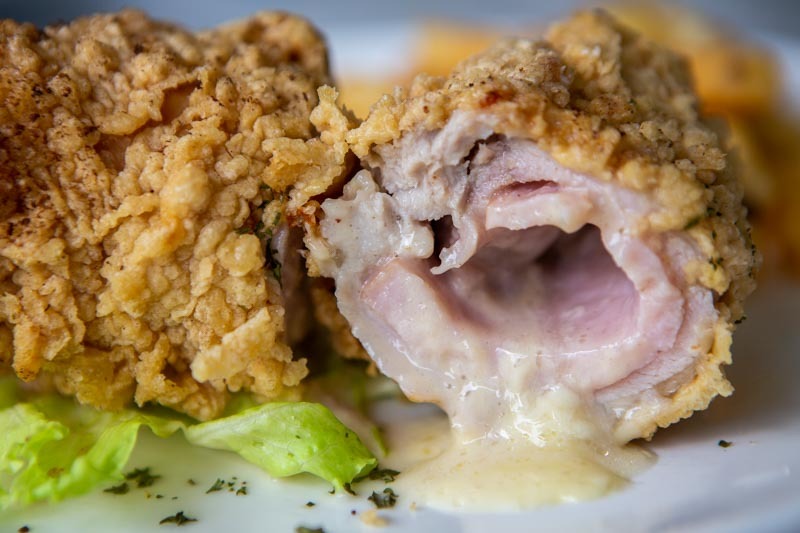 We were already salivating just looking at the golden hue of the chicken cutlet. They also slathered it with a generous glaze of salted egg yolk sauce. Unfortunately, the dish fell slightly short of our expectations. For one, we felt that the chicken could have used an extra minute or two in the deep-fryer. It had a slightly rubbery texture which was a little off-putting. Also, the salted egg yolk sauce had a subtler flavour than we were expecting. Though it had a perfectly creamy consistency, we felt it lacked the sweet and salty notes of a typical salted egg sauce. This dish was a big miss for us. However, the owner explained that he abstains from using excessive salt and any preservatives in his dishes. This is in consideration for his customers, a significant number of whom are from the elderly community. So if you’re big on flavours like us, take note! The next dish was the one I was personally looking forward to the most. Of all the dishes we had, the DE AR Cordon Bleu Chicken, Ham & Cheese 阿德奶酪火腿鸡排 (S$8.80) took the longest to serve. Just sliding the knife against the spectacularly crackly crust produced a wave of gooey cheese oozing out from within. This was definitely a sign of good things to come. 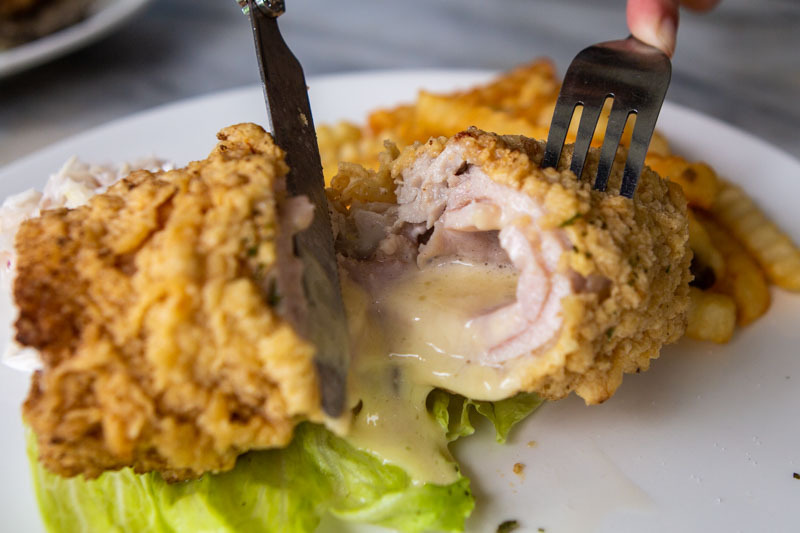 The juicy chicken and unbelievably thick ham contrasted with the crispy crust exceptionally. Every bite had a slight crackle which broke into a comfortably soft chewy texture. Not only that, the cheese brought all the ingredients together, infusing a wave of saltiness in every mouthful. That said, this dish takes a long preparation time of up to 20 minutes. But trust me, it’ll be worth the wait! Last up, we had a classic Western dish, the Grilled Chicken Black Pepper Sauce 黑胡椒酱鸡排 (S$6.80). We had wanted to give this a pass but the owner was adamant that we try it so we had rather high expectations for it. 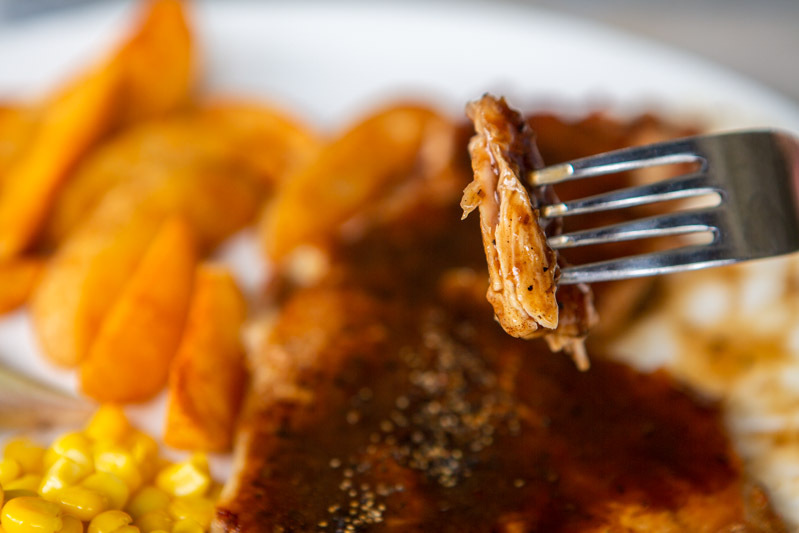 We noticed that the grilled chicken was very thin, suggesting that they had tenderised it. As such, the chicken was incredibly juicy and chewy. Not only that, they also drenched the chicken with a pool of black pepper sauce. Thick and luscious, the sauce was a great accompaniment to the chicken. It had a delectable peppery and umami flavour which contrasted the saltiness of the chicken well. Every main dish also comes with two side dishes. There’s a variety to choose from, but my personal favourite had to the Potato Wedges 土豆块. They’re fluffy on the inside and extremely addictive. 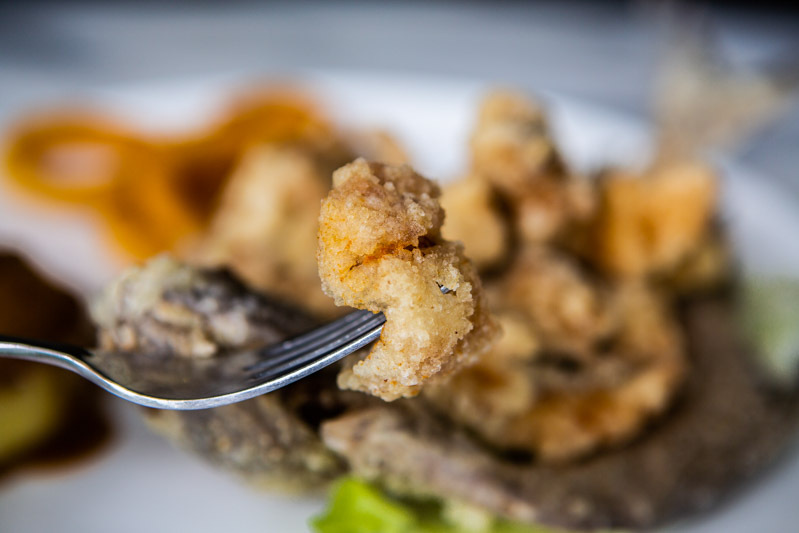 Overall, we agreed that the dishes here at De Ar Western came in very hearty portions. It’s simply a bonus that the prices are so affordable. Although De Ar Western only opened in February 2019, they’ve already gained themselves a regular customer base. 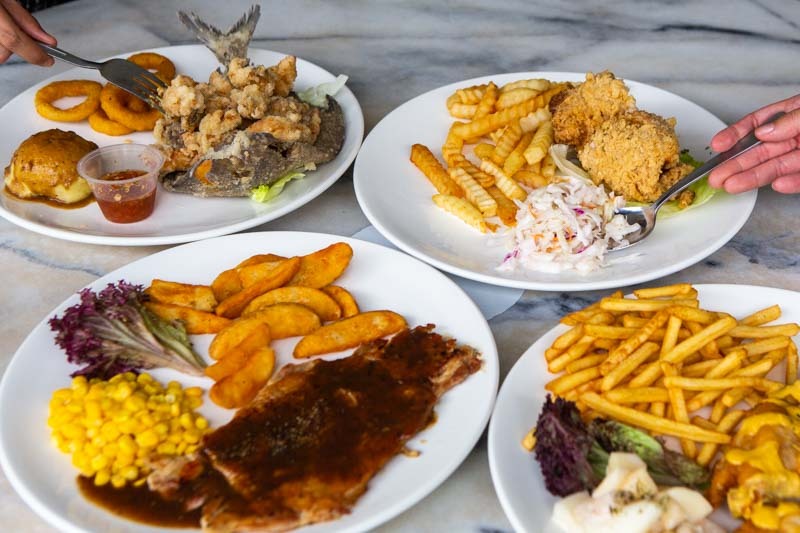 I’m definitely returning for their unique Western dishes, especially that one-of-a-kind Pomfret & Chips!